Partners Ghent University, VITO, KULeuven, University of Antwerp, BioBase Europe Pilot Plant Industrial Adivsory Board: 3M, Alco Biofuel, Arcelor Mittal, Avecom, Borealis, Cargill, Eastman, ENGIE Laborelec, Hydrogenics, INEOS, Messer, Monsanto, Nutrition Sciences and Smart Bioprocess. The main objective of the project is the development of technologies for the conversion of CO2 to value-added chemicals using catalysis and renewable energy. To benchmark, compare and develop the various technologies, the formation of formic acid was selected as the initial target. Formic acid is the first product of the hydrogenation of CO2towards value-added chemicals. 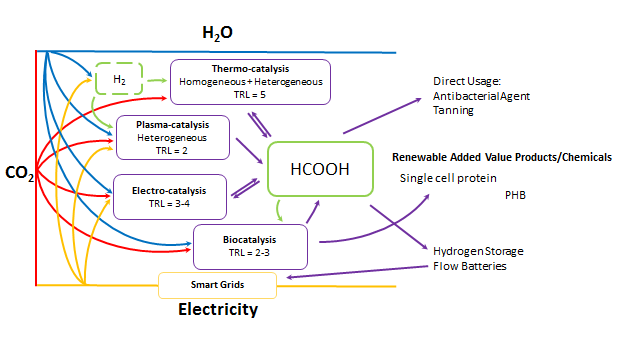 In the project, the development of 4 catalytic routes (homogenous & heterogeneous catalysis, photochemical plasma-catalysis, electrochemical catalysis and bio-catalysis) is planned, enabling the sustainable synthesis of formic acid and more complex value-added chemicals (Single Cell Proteins, etc.). The second objective is the valorization of formic acid. On the one hand, formic acid will be used as a building block for the bio-catalytic production of value-added chemicals such as Single Cell Proteins. On the other hand, formic acid is considered as a H2 carrier to propose a circular economy with CO2 and H2/electricity generated from renewable sources (POWER to CHEMICALS). This project has the ambition to strengthen the position of Flanders in terms of research into CO2-based processes and materials. The relevance of this cluster SBO project is further emphasized by an industrial advisory board, who are eager to implement the results and create economic valorisation.